As a stand-alone device, you can read content stored on an SD card that simply inserts into the back of the unit. Prepare and download your pre-translated materials as brf, brl or txt files and transfer them to the SD card provided. Use any braille code, in any language and of any genre including music, maths, or your favourite book. The Orbit Reader 20 from RNIB comes with pre-installed content, including a variety of books and a dictionary. Use Bluetooth to connect to your Apple, Android or Kindle device and access a world of books through reading apps such as Kindle®, Adobe Digital Editions® or iBooks®. The translation into braille is performed by your device's screen reader to give you a quick braille output on your Orbit Reader 20. SD card; pre-installed with a selection of books and a dictionary when purchased from RNIB. Prepare and download your pre-translated materials as brf, brl or txt files and transfer them to the SD card provided. Use any braille code, in any language and of any genre including music, maths, or your favourite book. "RNIB are very excited to announce the launch of the Orbit Reader 20 across the UK on the 8th of October. We want to show our commitment to braille and celebrate national braille week with the release of this revolutionary device. 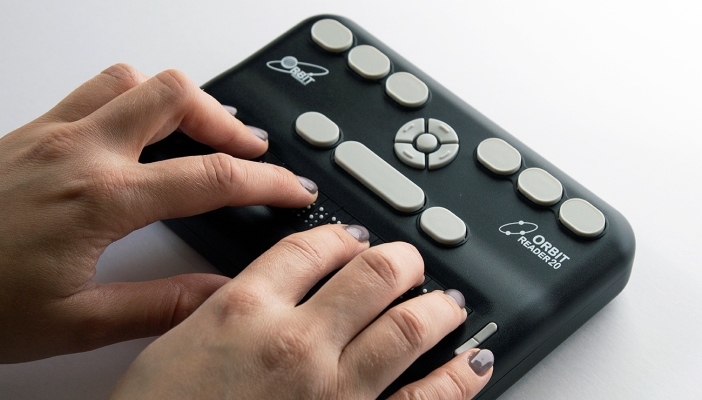 The Orbit Reader is the first of its kind, combining the features of a braille reader, simple notetaker, and braille display at an affordable price. We’re proud to have played a part in the development of this new and game-changing generation of products." - Claire Maxwell, RNIB Senior Product Developer. To purchase the Orbit Reader 20 visit our online shop or contact our Helpline on 0303 123 9999. The Orbit Reader 20 costs £449 ex VAT / £538.80 inc VAT (includes delivery). RNIB Connect members are able to purchase at a discounted price. Simply type in the offer code when prompted on the basket page of our online shop. If you don’t yet have the code, please contact our Helpline to order. If you're not already an RNIB Connect member, you can sign up when you order to receive the discounted price. Simply call our Helpline on 0303 123 9999. RNIB are working with VICTA to offer a grant scheme for children and young people with sight loss which provides technology that will help them live independently. If you are registered blind or partially sighted, a UK resident and aged between eight and 25 years you could be eligible for an Orbit Reader 20 for Braille users. If you are registered blind or partially sighted, a UK resident and aged between 11 and 25 years you could be eligible for an Apple iPad Air 2 32GB. For more information or to apply, visit VICTA's website.